1 x single rod of Boro Cortex measuring 7mm dia x 490mm long. 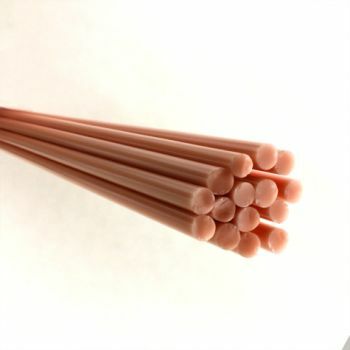 Cortex is a light pinkish-peach hue. This colour is mostly opaque, with a slight translucency to enhance its fleshy quality. The RealTones are great for sculpting. They smooth out nicely when coil-potting, leaving minimal witness lines. Molten Aura Labs' Cortex is a WYSIWYG and can be blended with other RealTones. Use a neutral flame and heat up gradually in the back of the flame. Rods may have white specks that typically melt in as heat is applied.